Antifa members gather to protest the right-wing No to Marxism rally in Berkeley, California, on August 27th, 2017. For months, the American public has debated how best to confront the fascist right as its members attempt to build power. 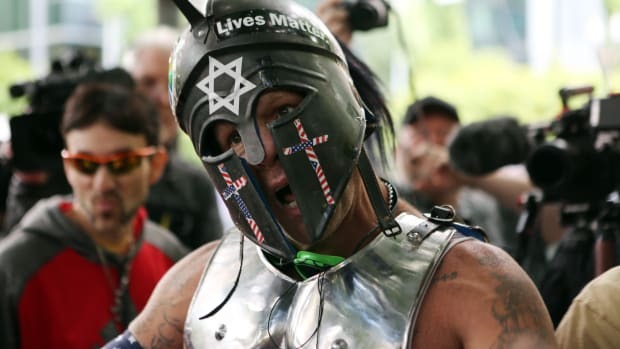 Now, after being chased out of Boston and then the Bay Area, America&apos;s white-power activists seem to be on their collective back foot for the first time in over a year. How did this happen, and what can we learn about how to keep them in retreat? Among those on the broadly defined left, the main strategic split with regard to fascists has been between those who favor prevention by any means (up to and including physical confrontation), and those who think it&apos;s best to let the marketplace of ideas take care of their worthless ideology. Call it antifa versus free speech. A lot of people have changed their position on this in reaction to unfolding events, but the poles have remained intact. Antifa still wants to bash the fash, and free-speechers still want to tease the KKK into obscurity like Superman did. Somehow, both sides still think they&apos;re right. It&apos;s important to note the antifa/free speech division doesn&apos;t split evenly between liberals and the far left. There are capital-D Democrats like former congressman John Dingell, who tweeted "I signed up to fight Nazis 73 years ago and I&apos;ll do it again if I have to," and there are ex-revolutionaries like Todd Gitlin who think antifascism is "alienating." 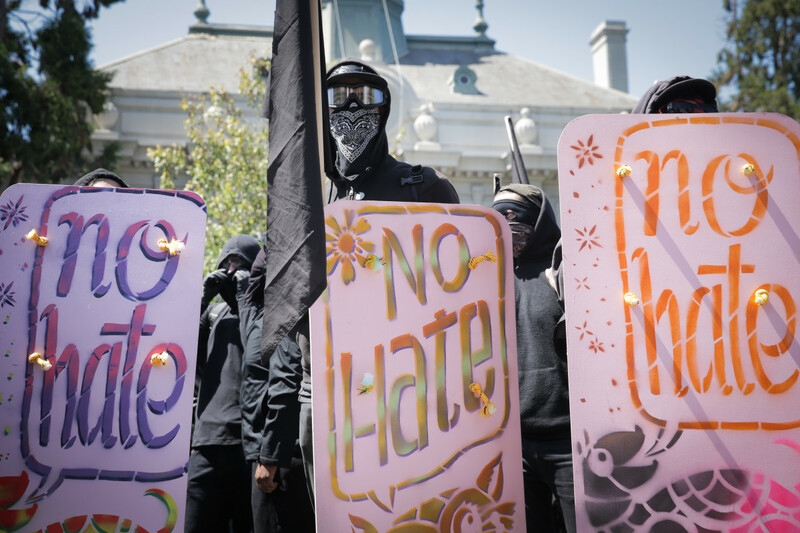 The free speech crowd certainly does know how to speak, and their central success has been publishing articles that reinforce the idea that antifa scares away allies and emboldens the right. These pundits clearly do speak for a segment of the population, and it&apos;s possible that black bloc outfits and videos of street fighting—touted incessantly by right-wing media—are turning them away from the antifascist cause. The more alienated these observers feel, the more correct they consider themselves in condemning antifa. But antifa isn&apos;t trying to earn the support of 51 percent of any electorate. Our main concern is winning, and we don&apos;t need nearly that many people to do it. The chaos and brutality in Charlottesville showed what&apos;s at stake, and what happens when antifascists are outnumbered. Fascists showed up hoping to hurt people, a posture that gave them a fighting advantage when both sides were equal in strength. Antifascists were able to protect other activists from further harm and possible death, while the struggle of Corey Long and Deandre Harris and the martyrdom of Heather Heyer inspired nationwide introspection—even if President Donald Trump thought about it and landed on the wrong answer. It&apos;s hard to watch this footage and not conclude that standing up to white supremacists—literally just standing—requires conscious self-defense. People were horrified by the white-nationalist show of strength in Charlottesville. But since then, fascists attempting to maintain their momentum have instead crashed into a brick wall. In Boston and San Francisco, thousands of antifascists flooded the streets to shut them down, leading to a reversal of the infamous torch march pictures: a few dozen white supremacists, surrounded by the outraged citizenry. Compared to Charlottesville, the violence was minimal, and that&apos;s how it&apos;s supposed to work. When antifa wins, there&apos;s little fighting, and participants move on to other things, like disaster relief; when the fascists win, there are death camps. Luckily, the free speech side is right about one thing: Fascists are not a dominant force in American politics, their West Wing access notwithstanding. If we want to make them feel deeply unwelcome and vastly outnumbered, antifascists don&apos;t need everyone to the left of the KKK to show up ready to throw down. A 10- or 20-to-one anti-to-fa ratio is sufficient, which means we&apos;re talking about minor-league baseball attendance numbers here, tops. And I don&apos;t mean a 10,000-person black bloc: a small militant core can protect a broad diversity of antifascists. 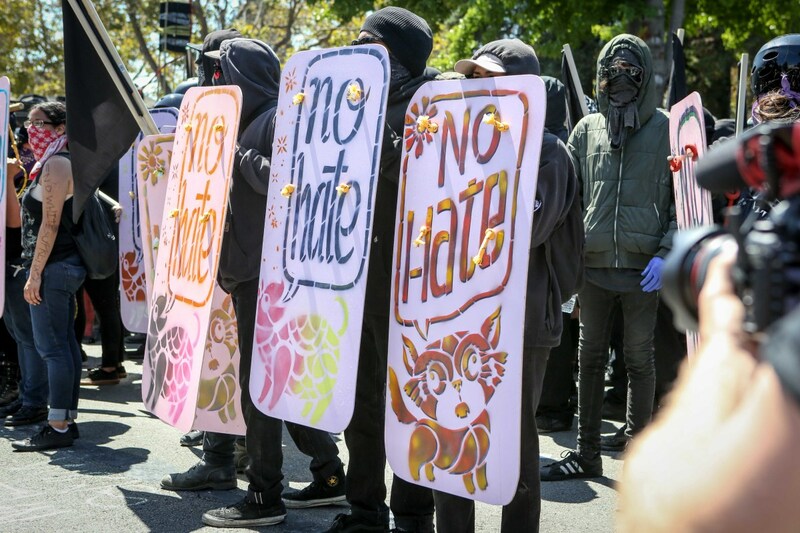 That&apos;s what Mother Jones reporter Shane Bauer saw in Berkeley: "Many attendees expressed surprise at the unprecedented level of coordination between groups that don&apos;t always get along," he wrote. That visibility means Donald Trump and Fox News now love to cite the menace of antifa, but as ideologically and venally motivated liars, they will always find their bogeymen on the left—whether that&apos;s college professors, the (irrelevant) New Black Panthers, or a pizza parlor in Washington, D.C. Worrying about whether we&apos;re giving them material for their lies is a fool&apos;s neuroticism. They&apos;re going to make up fake news anyway—turning a fascist who lost a fight into an innocent bystander or lending credence to the guy who stabbed himself and blamed antifa. 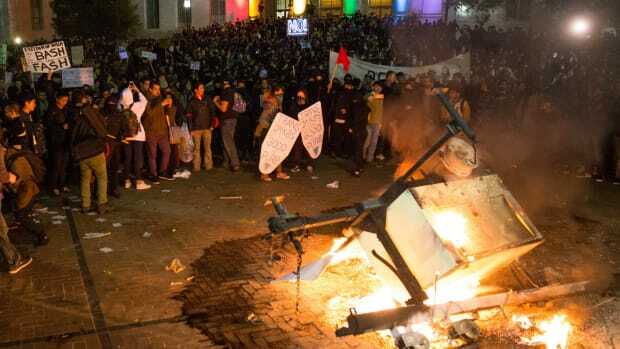 The truth is that most pundits (on the right and supposed left) are happy to fall for these "vicious antifa" stories because these pundits are more concerned with order than justice. For them, people fighting in the street over politics will always conjure images of other countries where they don&apos;t want to live. It upsets them. That&apos;s not a serious analysis of the situation on the ground; it&apos;s a visceral, emotional reaction—the same one that inevitably arises against every group or movement that upsets the order of things. The pundits are card-carrying members of the order of things, and they are upset. But they have not and will not stop the people who are refusing to hand their communities over to fascists, not for a day, not for an hour, not for a minute. Hundreds of people dressed in black converge on Berkeley, California, on August 27th, 2017. 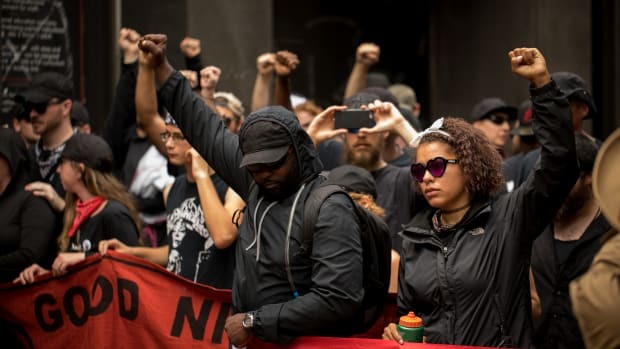 The park became a center of left-wing protest when hundreds of people opposed to President Donald Trump and hundreds more aligned with antifa descended on it after a planned right-wing rally was canceled. There is no such thing as a non-violent fascist march. Maybe some people feel safe with bands of armed Nazis roaming their streets, but I certainly don&apos;t. The key to preventing violence isn&apos;t ceding public space to the torch-bearers because they&apos;re willing to hurt people, it&apos;s making sure they have no room at all. The proof is in the pudding: After being overwhelmed in Boston, the alt-right canceled a 67-rally day of action scheduled for September 9th. If masses of people hadn&apos;t showed up to confront them in Boston and the Bay, we don&apos;t know the kind of violence and brutality we would be preparing for. It&apos;s a victory for peace that we won&apos;t have to find out. For all the self-righteous talk on the free speech side, the antifa ranks are swelling. While the pundits and right-wing politicians spin themselves into a tizzy over black masks, antifascists are winning credibility, building alliances, and earning the admiration of everyday people. Clergy members at Charlottesville—some of them strictly committed to non-violence—credited antifa with saving their lives. A Lutheran parish administrator named Logan Rimel summed up his experience: "White Christians, if you aren&apos;t willing to personally take a bat to the head, shut up about antifa." 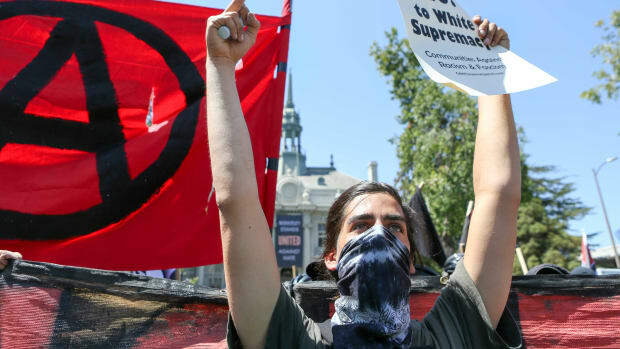 University of Virginia professor Siva Vaidhyanathan regretted his decision not to stand with antifa during the Charlottesville chaos: "A young man named Dre Harris was ambushed in a parking lot and took dozens of blows by club-wielding thugs. He took them so I wouldn&apos;t have to," Vaidhyanathan wrote. 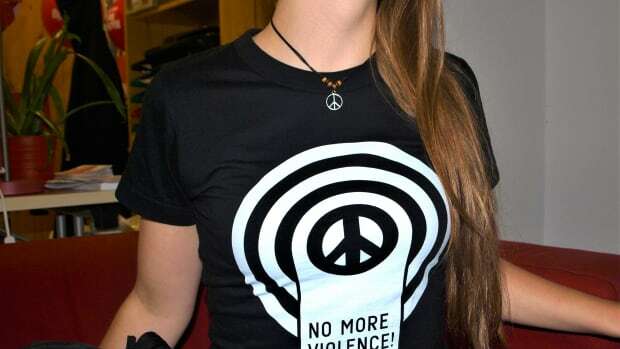 "Next time I will stand on the street with my neighbors, even at the risk of injury or death." The needle is moving, and open-minded people in good faith have begun to recognize antifa for the defensive formation that it is. I&apos;m sure the people who want to let the Nazis fizzle out on their own have good intentions. I don&apos;t believe my argument, or any argument, will change their minds. And I&apos;m sure they won&apos;t have any trouble finding microphones to amplify their concerns. But even if the antifascist ranks never grow beyond groups like Black Lives Matter, progressive communities of faith, and people to the left of Bernie Sanders, that will be more than enough to win. If winning this fight means those groups can build trust, solidarity, and interdependence, they can set themselves up to do a lot more than that—and it will be the fascists who are sorry they ever showed up. 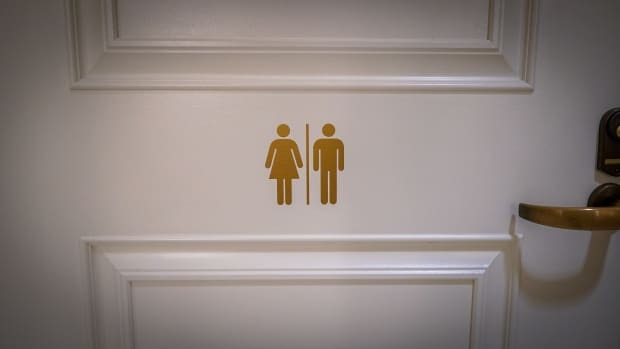 Egalitarian movements won't work if we keep putting the onus on the non-conforming.